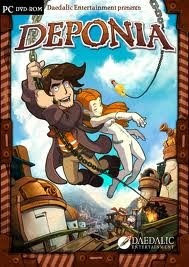 Deponia was released for Mac and Linux in Germany on January 11, 2012 and in English on June 29, 2012. A Linux version was released on July 8, 2014. In the game, a wealthy woman named Goal falls unconscious on the garbage planet of Deponia and is found by an ill-tempered man named Rufus.